A few days ago our 2 week old chicks arrived. We have them all cuddled up in their temporary living space. I have to say I am glad that I decided to go with the 2 week old chicks instead of the more fragile day-olds. They are adorable little cheepers! I love to watch them as they dip their little beaks into the water and tilt back their heads to drink. Between the puppy and the chickens I am feeling like quite the mother hen! If you are looking at getting chickens I recommend looking around locally for what varieties are available and do well in your climate. 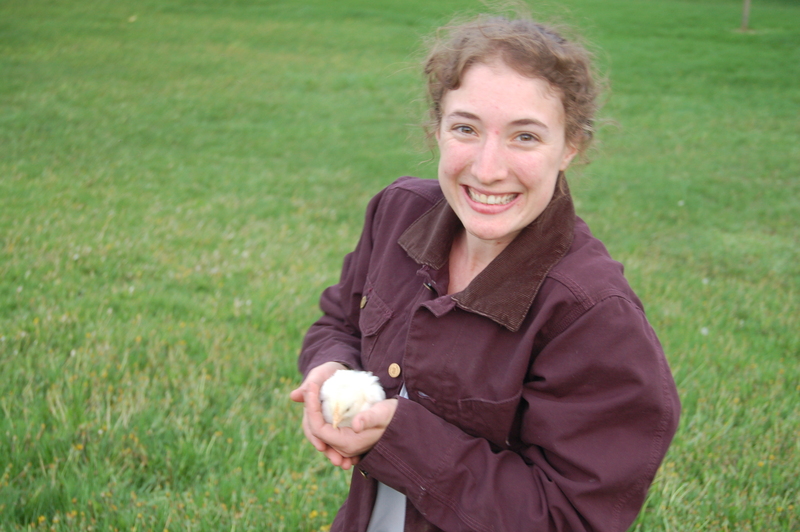 You can also take a look at some of the better egg producers or broiler birds. 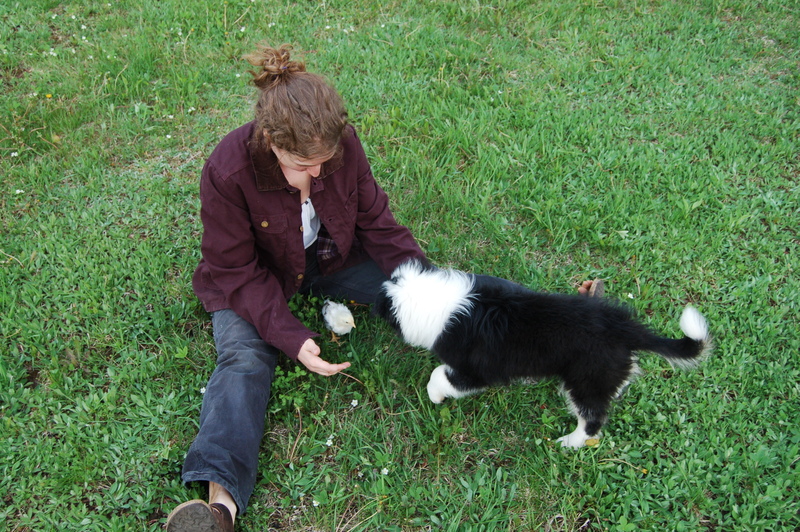 Read up on the breeds and find the one or ones that are right for you. There are a whole bunch of really neat breeds out there – I’m all about the colourful egg layers (Araucanas(blue), Ameraucanas(blue) and Easter Eggers(blue/green)). Check out this neat resource for finding the breed that is right for you! 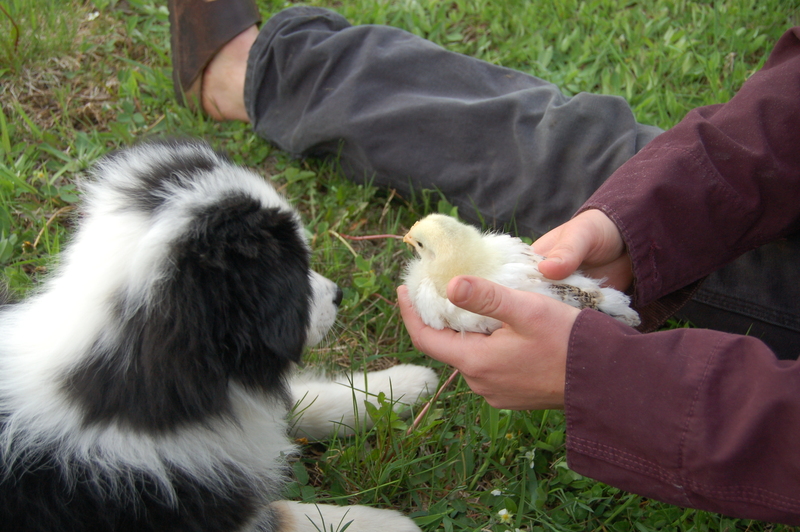 Here is a guide for preparing for and tending to chicks! It is very important that you select a dish or device that is designed for chicks. If the water spills and the chicks get wet they will not fare well. Chicks also love to scratch and peck in their bedding so you want a dish with that will get the least amount of mess in it. I decided to go with a hanging one – that way it is up out of the bedding and will not spill. Mine also holds 2 gallons of water, this allows me to dump the water often throughout the day without having to fill it up. I used wood shavings making sure not to use cedar because it is not good for the chicks to inhale. You may also use paper towel or any kind of animal bedding. DO NOT use newspaper because the slippery surface can cause splayed leg syndrome in the birds. There are many different shapes and sizes of feeding dish. I went with a long trough style that seems to work very well for my flock. Once again it is wise to get something designed for the purpose. They will poop and dig in whatever they can. Make sure that you have a feeder big enough for your flock. A note about the style of feeder I purchase is that it has very sharp edges; be careful sliding back the covering. 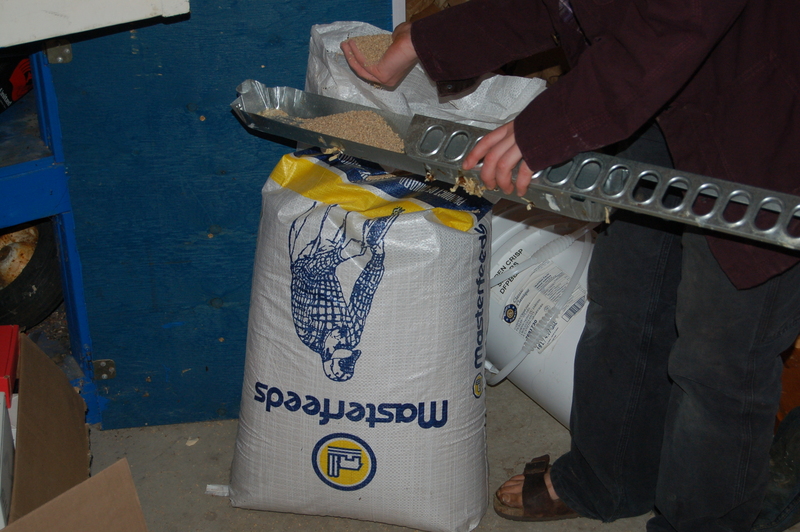 There is a specific feed for the chicks that you can pick up at any farm supply store (or often from where you get your chicks). It is often referred to as chicken crumble. It is a complete diet for the chicks and you do not need to add anything to it. We picked both our chicks and our feed up at The Old Co-op in North Gower. If you feel like treating your chicks to a special snack once in a while check this page out for ideas. I don’t know how I feel about feeding them egg, but fruit, plain yogurt and bugs seem like good choices. I recommend using an infrared bulb, this is said to stop them from pecking at each other and make it easier for them to sleep. You should pick up a light fixture designed for this (250 watt), a regular house bulb will not do. 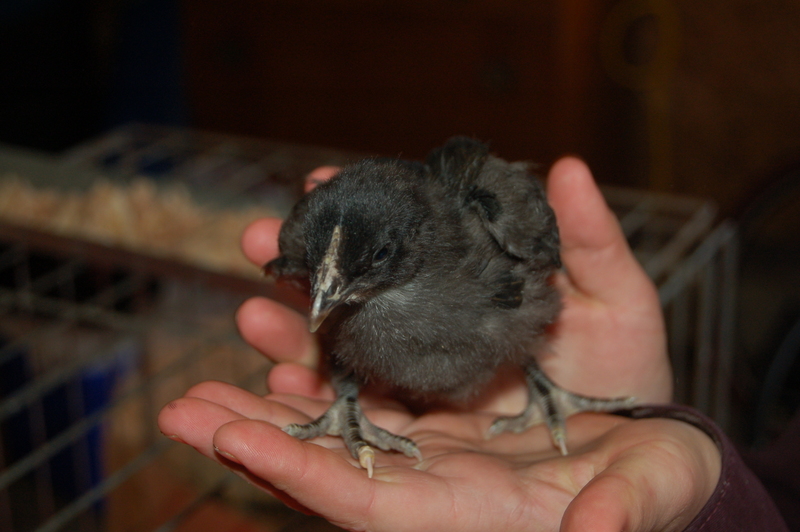 You want the chicks to be at 95 at one week old, 90 at two, 85 at three and so on until they are ready to go outside. Hang the light somewhere central in their living space and pay attention to how the chicks are responding to it. If they are all hiding in the corners or opening their wings and crouching down its too hot and you should raise the light. 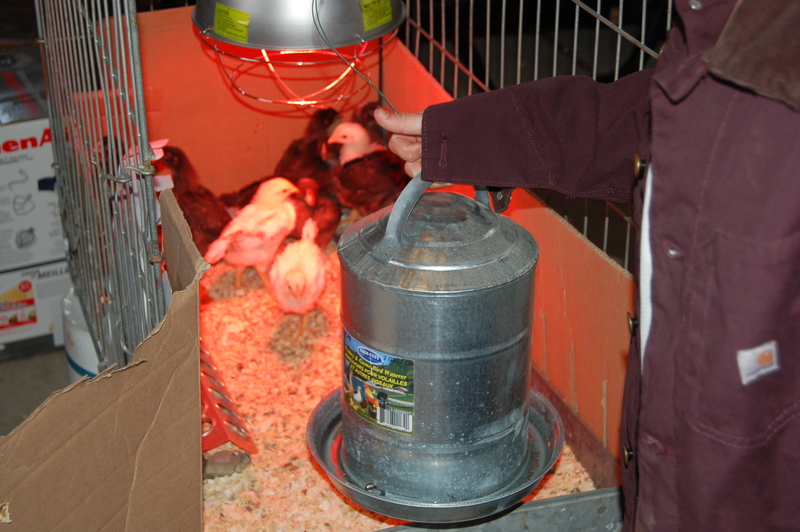 If they are all huddled together under the light it is too cold and you should lower it. A happy flock will be spread out and exploring. The birds will need somewhere to live. This can be a plastic swimming pool, a Rubbermaid bin, a pen or a large cardboard box. You should aim for a square foot or two per bird. The birds need enough room to spread out and explore. But be warned these little guys can jump! Make sure that you have some kind of breathable cover. The enclosure needs to be well ventilated and protected. We used an old dog crate, inserting cardboard around the base to provide a little protection and stop the chicks from escaping. We will have to move them to something larger at the end of this week. Once you have all of these things you are pretty much ready to go! 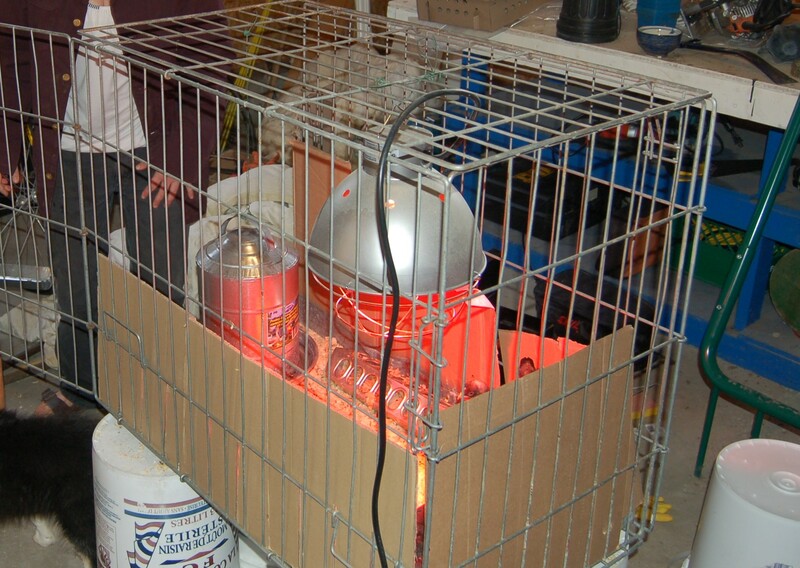 Set up the brooder with about 1 inch of bedding, the light located in the center and fresh food/water. Pick your chicks up and introduce them to their first home! I checked on my chicks every half hour or so the first day but now check once every 1.5 – 3 hours. When checking on your chicks you should make sure that they have clean water/food, they look comfortable with the temperature and they are all still there. I change the water almost every time I check on the birds. They are very good at kicking the shavings and their poop into it. I change the food once or twice a day, and the bedding twice a week. Twice we have gone in and counted one less than we ought to have. Lucky both times the pullet was not far off, but it is something to be aware of. You should also check the bums of the chicks to make sure they are not clogged with dry poop. This can be very bad for the little guys and lead to death. If you see a glob stuck, just wipe with a warm wet cloth to remove. By week two you can start to bring your chicks out to explore. You must only bring a few out at a time and pay very close attention. The chicks are very fast and can squeeze into small spaces. Just bring them out for a short period each day. If you have a pen you can setup outside to leave them out a bit on warm days- even better!! That should be enough to get you started! Make sure to take lots of pictures and enjoy them while they are adorable, chickens do not stay that way for long! !